Park Forest, IL-(ENEWSPF)- With all we’ve heard through the years about America being a so-called “Christian nation,” and the more we will hear during the upcoming presidential race, here are some official words on that notion, enshrined in the Treaty of Tripoli, signed into law June 10, 1797 by President John Adams. 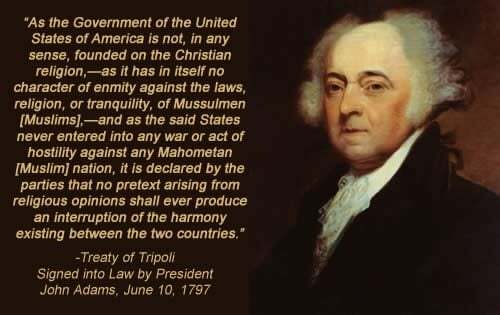 While the treaty was only law for eight years, it certainly provides insight into the minds of the Founding Fathers with respect to religion and government. The Senators signed it, and no one objected to Article 11. Read the treaty here. The passage cited above is from Article 11.